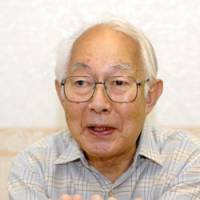 For Kotaro Kaneko, 81, entering the elite Imperial Japanese Army Academy during the war was merely a way to a better life and pay, just as students today go to university to get a better job. If he hadn’t chosen the academy, Kaneko’s alternative would have been to enter high school and be drafted at age 20. He was just being realistic. 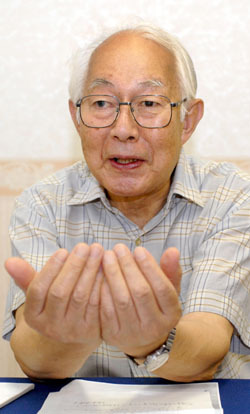 The academy recruited well-educated students like Kaneko who entered the University of Tokyo after the war. It was considered a privilege to enter the academy, especially for students in rural areas, he said. “My classmate from the countryside told me everyone in his village came to the station when he was leaving for the academy,” Kaneko said. Graduates who were about 20 became sergeant major, the highest noncommissioned officer, and were soon promoted to second lieutenant, the lowest officer rank. Kaneko’s aloof attitude toward the rabid patriotism during the war was something he developed at a young age. When he was in elementary school, his headmaster used to take out a photo of Emperor Hirohito with white gloves, show it to all the students and read the Imperial Rescript on Education, which glorifies Japan as an empire and advocates its moral principles. Every school had a “hoan-den,” a small shrine containing a photo of the Emperor, (later known posthumously as Showa) and Empress. When boys around him dreamed about becoming soldiers, Kaneko, who was neither outright opposed to nor gung-ho about the war, thought it was simply the path that lay ahead of him. His country’s circumstances probably led him to enter the academy. At the time, military officers would hold classes at junior high schools to show students how to march and use guns, he recalled. “The officer taught us we were going to war, holding a gun at his side,” he said. His junior high school in Kamakura, Kanagawa Prefecture, also forced students to attend a military academy. First- and second-year students were allowed to apply for a prep course designed for elite students, he said. Fourth- and fifth-year students had to choose between the army or naval academy exams. Students usually enrolled at the academy in April, but Kaneko joined in November 1944, six months early, and stayed there for 10 months until Japan surrendered in August 1945. “I was merely expendable,” he said, noting he had to enroll earlier because Japan was short on pilot officers. Even after entering the academy, Kaneko was not what one might call dedicated. He had to wake up daily at 5:30 a.m., fold his night wear perfectly, visit a small shrine outside the dorm and read the Imperial Rescript to Soldiers and Sailors. It was so strict that a minor indiscretion would invite a tongue-lashing. “I had to read the rescript on a small hill, but there were gnats everywhere. So I sometimes scratched my leg with the other leg,” he recalled. But a senior student who saw this berated him. He was surprised the student didn’t hit him, he said. Seniority was always prioritized at the academy. For example, when the last senior at the table finished eating and put down his chopsticks, those junior to him had to stop eating, too, Kaneko said. Chow was also interrupted if he failed to fold his pajamas perfectly or his gun was not properly maintained, so he was always hungry — to the point that he looked up food names in the dictionary during self-study sessions. “For example, if it’s A, I looked for ‘ankoro mochi’ (rice cake with red beans),” he laughed. Intense classes and military training always made him tired and hungry, leaving him little room to think about the family he left behind. But this was not the case when it came to night training. The streets were dark because households had to observe a blackout against air raids, but Kaneko could clearly hear families talking and laughing. 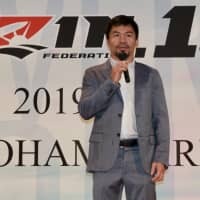 “I really missed my home during the night training,” he said. Kaneko was 10 months into his academy life when Emperor Hirohito announced Japan’s surrender. Reflecting on his wartime experiences, Kaneko can’t help but be critical of the military mentality that prevailed at the time. “An officer’s order was the Emperor’s order,” he said, adding if an officer said a cat is a dog, then it is a dog and you could never correct it. “It was normal to believe in irrationality,” and this drove us to wage war, he sighed. What Kaneko wants his country to do now is change politics so Japan never again wages war, a promise codified in Article 9 of the Constitution. “The shift from (U.S. President George W.) Bush to (Barack) Obama was a huge change. 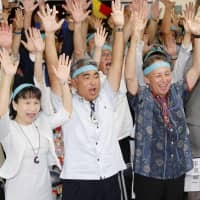 I wonder if the Democratic Party of Japan can bring such a big change,” he said of the DPJ’s stunning defeat of the long-ruling Liberal Democratic Party in the Aug. 30 general election. But Kaneko still remains a realist. “I’m afraid some DPJ members want to amend Article 9,” he said.